Earlier this week, I posted about Metro Vancouver’s Sustainable Innovation Fund, and how Langley City may be receiving funding to put together a business case for urban farming. Metro Vancouver also has two special Sustainable Innovation Funds for the region’s sewer and water services. One of the pilot projects that got my attention was $4 million dollars for a hydrothermal processing facility. This facility would be built at the Annacis Island Waste Water Treatment Planet. Right now sewer sludge is turn into biosolids that must be deposed of, or used as fertilizer. About 50% of carbon is lost in the process which contributes to GHG emissions. Hydrothermal processing turns sludge into biocrude, methane gas, and carbon dioxide. The CO2 released into the air is significant less than the current way sewer sludge is treated. You can read a presentation from the US Department of Energy for more information about this process. Biocrude can be used at refineries instead of regular crude oil, and the methane gas can be used as a fuel for heating. This process reduces the use of fossil fuels. It also save Metro Vancouver money as biosolids no longer have to be transported around. 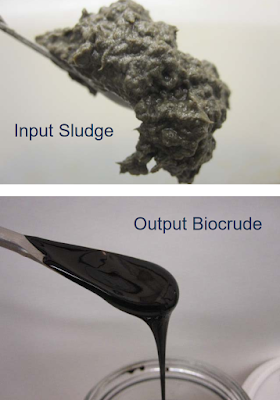 Top: sewage sludge. Bottom: biocrude. Select images to enlarge. If $4 million from the Liquid Waste Sustainable Innovation Fund is approved by the Metro Vancouver board, and $1 million is secured form the Federation of Canada Municipalities, this pilot project will be able to proceed. It will bring a whole new meaning to the term liquid gold. I agree - this is an interesting direction. Thank you for posting it. I would however not that "biosolids" used as "fertilizer" is problematic. There have been many new scientific reports about serious problems with applying biosolids on land.